New York Herald-Tribune, 1956 - 1966, mostly covered the Dodgers, until they left town for Los Angeles, CA. Tommy Holmes and Bob Broeg were the recipients of the 1979 J.G. Taylor Spink Award. Red Smith described Holmes as "the best baseball writer of his time, possibly of all time." As evidenced in his bright and sprightly writing style, Holmes' personality was sensitive but unassuming, honest yet unpretentious, witty and intelligent. 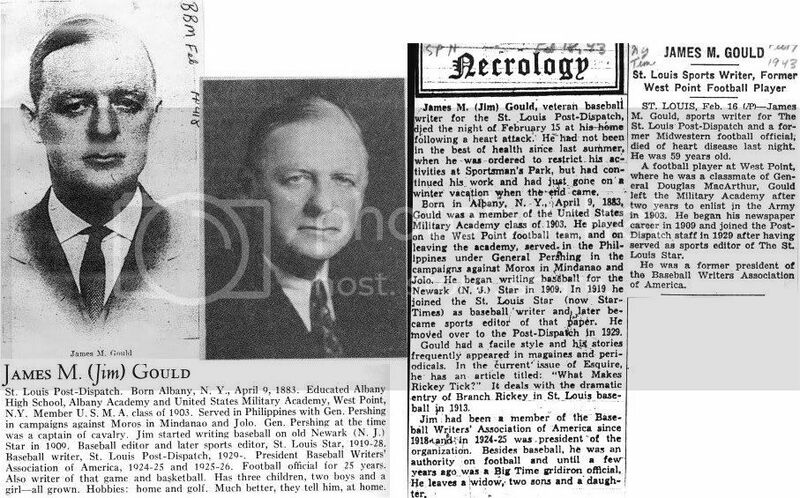 A thorough student of the game, Holmes covered the Brooklyn Dodgers for the Brooklyn Eagle and for the New York Herald-Tribune from 1924 until the club's move to Los Angeles. He was an acutely perceptive and observant writer who employed a direct and simple style. 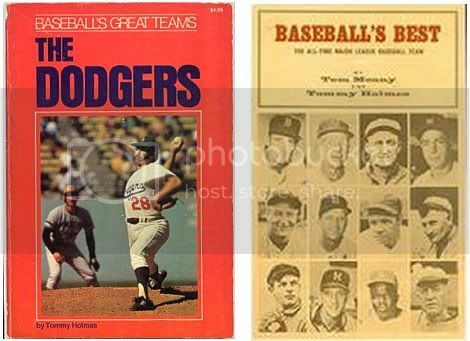 Holmes, a splendid historian, authored a pair of books on the Dodgers as well as Baseball's Best with Tom Meany. -----------------------------------------------------------------------------------April 12, 1975, pp. 62, column 3-4. Last edited by Bill Burgess; 01-30-2013, 05:04 PM. He began to write baseball around 1900. Sporting News' article, June 12, 1941, pp. 6, column 2-5. 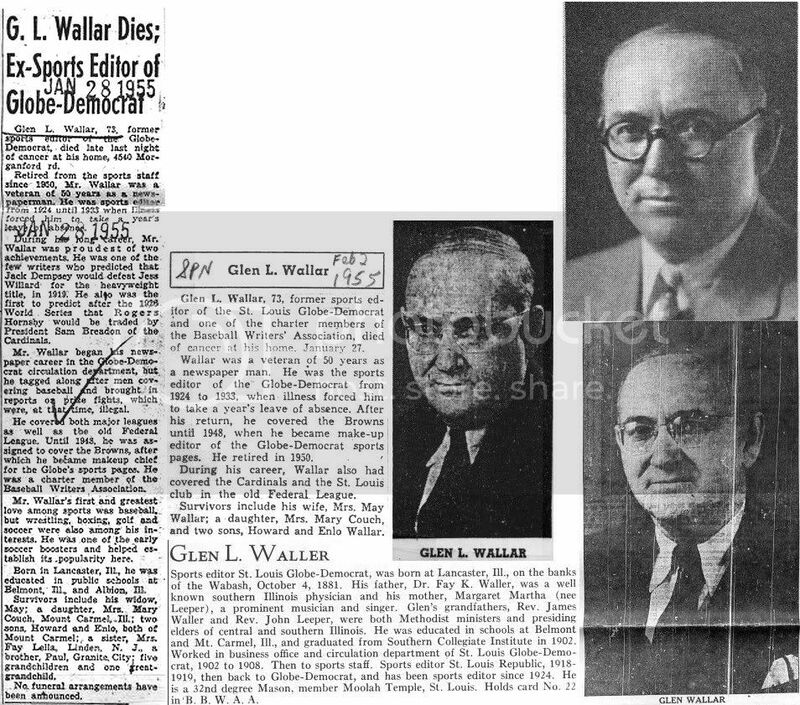 --------------------------------------------------------------------------Sporting News' obituary, January 25, 1945, pp. 17, column 4. 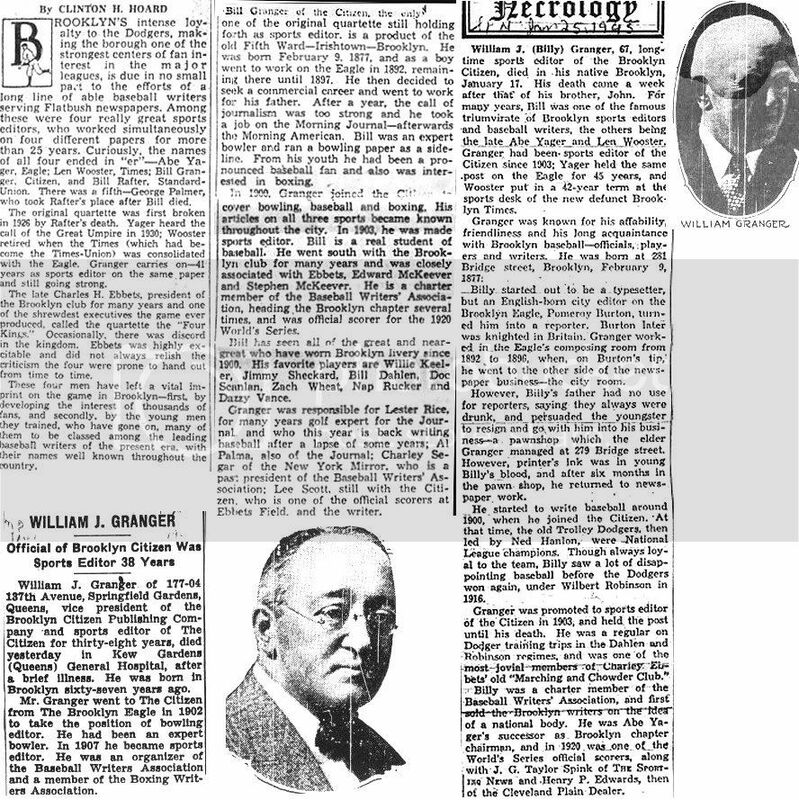 New York Times' obituary, January 18, 1945, pp. 19. Last edited by Bill Burgess; 12-11-2012, 08:31 PM. Left baseball to devote himself to crime & general law. 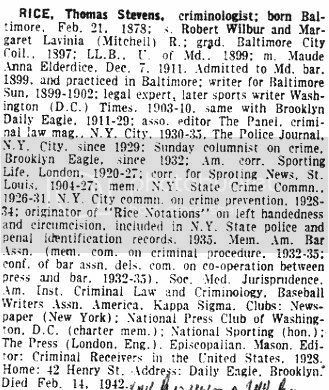 Admitted Maryland bar 1899, Member of New York State Crime Commission (1926-31). Last edited by Bill Burgess; 11-12-2011, 12:14 AM. Stephen Orlando Grauley---AKA Sog---an abreviation from the initials of his name. 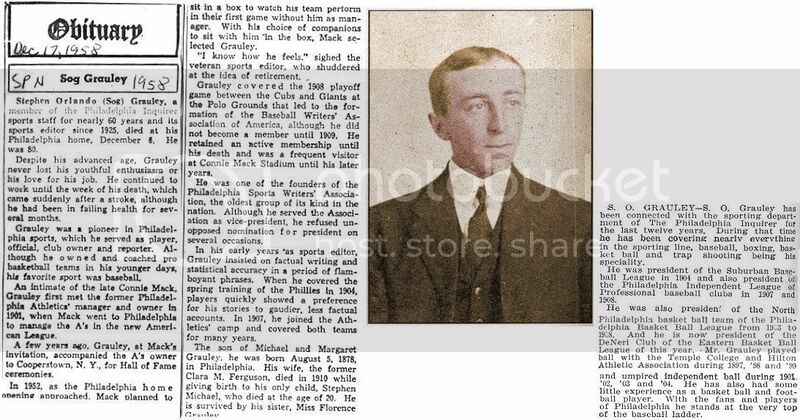 In Philadelphia sports, he served as player, official, club owner & reporter. Close personal friend of Connie Mack. Sporting News' article, May 18, 1939, pp. 6. Sporting News' Obituary, December 17, 1958, pp. 22, column 4. Last edited by Bill Burgess; 08-05-2012, 10:21 AM. Baseball was his favorite, but he also loved track & boxing. 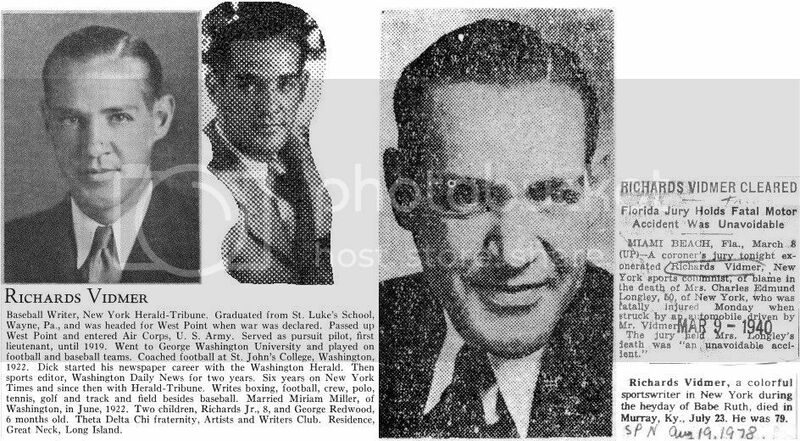 Chicago Tribune obituary, February 7, 1957.---------------------------------------------------------October 10, 1952: L-R: George Halas, Charles Dunkley, Chuck Comiskey. 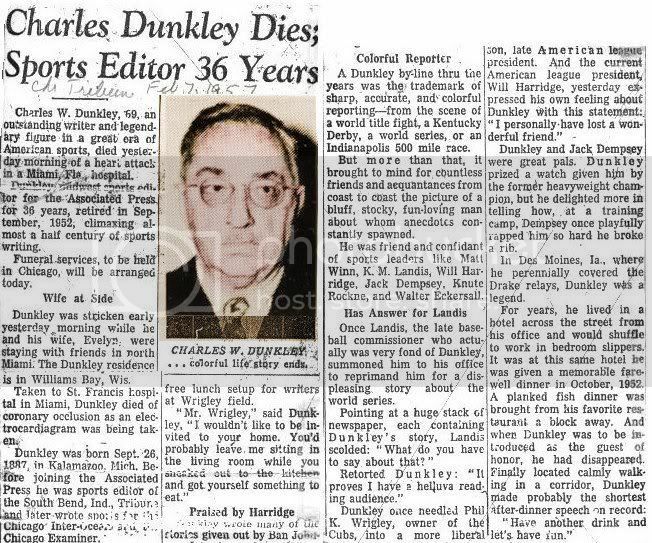 ----------------------------------------------------------------------------------------------------------------------------------Dunkley retired from AP after 41 years in Chicago testimonial dinner. Sporting News' obituary, February 13, 1957, pp. 32, col. 4. Last edited by Bill Burgess; 07-27-2012, 01:41 PM. Died: April 23, 1958, St. Louis, MO, age 77,---d. heart disease. Myocardial infarction, due to coronary thrombosis. 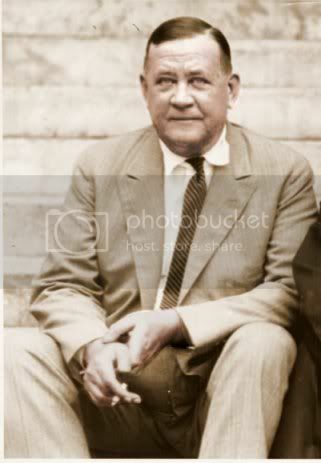 St. Louis Browns', traveling secretary, December, 1915 - November 14, 1936. 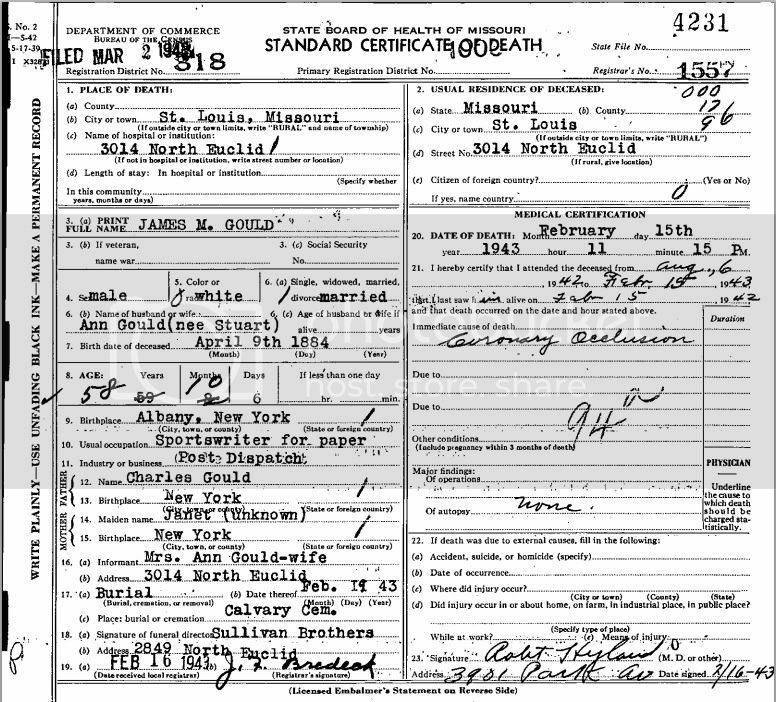 Father: Joseph; Mother: Lillian Kelly; Wife Mina Batchelder; Willis married Mina in 1903. Son: Willis Eldon, Jr.
April 23, 1958, pp. 40, column 1-2---------------------edited by Harold (Speed) Johnson, 1933, pp. 42-43. Last edited by Bill Burgess; 08-05-2012, 10:56 AM. Last edited by Bill Burgess; 01-18-2009, 02:36 PM. Cleveland Plain Dealer, 1918? - 1925? Cleveland Press, sports writer, 1930 - 1936? 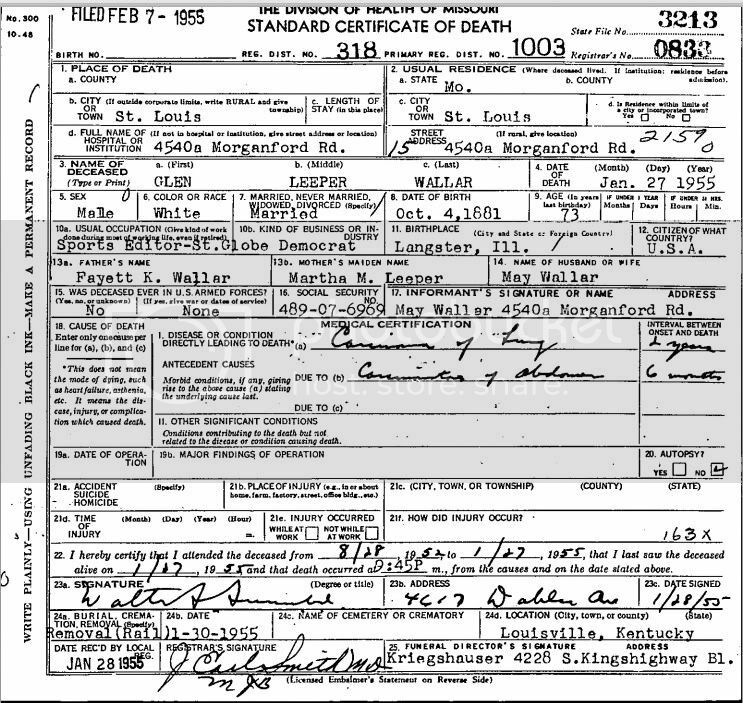 Father: Joseph; Mother: Jeanette McDonald; Wife Pauline Orient, born Cleveland, OH; Stuart married Pauline on June 26, 1915. -------------------------------------------------------Stuart's photo/entry in Who's Who in Major League Baseball,---Sporting News' obituary, October 31, 1970, pp. 54. ----------------------------------------------------------------edited by Harold (Speed) Johnson, 1933, pp. 506. Last edited by Bill Burgess; 01-30-2013, 05:11 PM. Last edited by Bill Burgess; 01-18-2009, 02:39 PM. Died: January 27, 1955, St. Louis, MO, age 73---d. at home of cancer. Worked business office / circulation dept. of St. Louis Globe -Democrat, 1902 - 1908. Then to sports staff, 1908 - 1918. St. Louis Republic, 1918 - 1919. St. Louis Globe-Democrat, 1919 - 1933, sports editor since 1924. 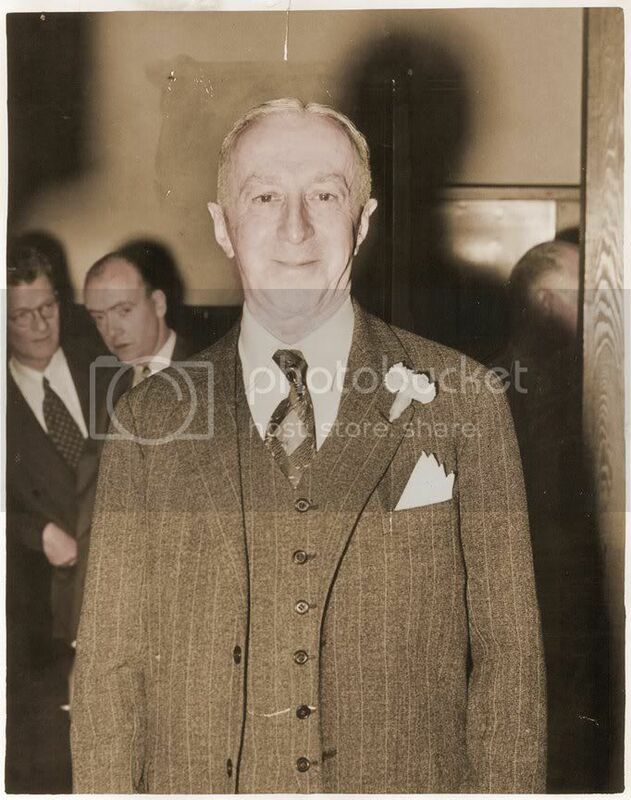 Was ill in 1933, returned to work as chief sports make-up editor, 1933 - 1950. 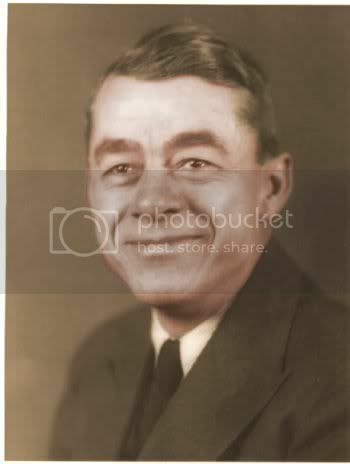 Retired in 1950. Also worked for Federal League Baseball team. ---------------------------------February 2, 1955, pp. 26, column 4. 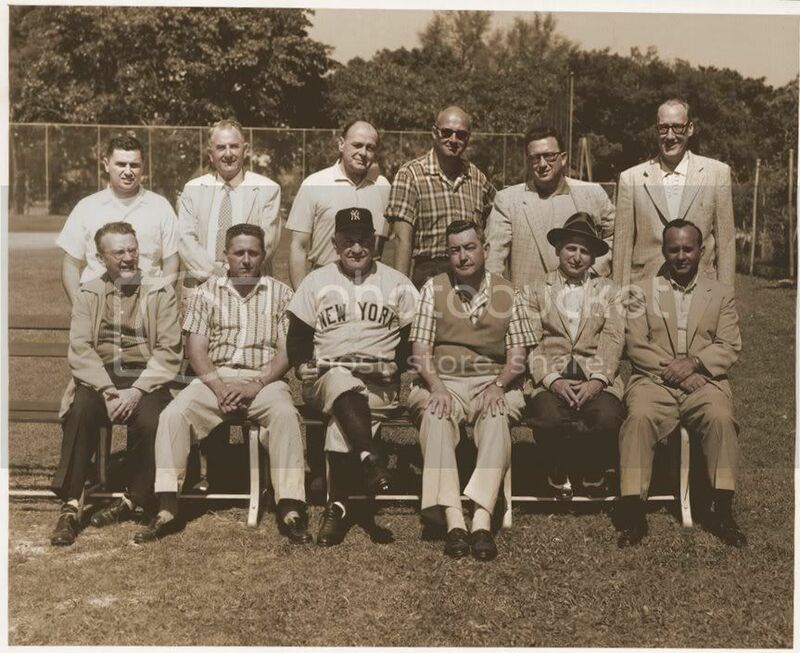 -----------------------------Who's Who in Major League Baseball, edited by Harold (Speed) Johnson, 1933, pp. 500. Last edited by Bill Burgess; 12-08-2011, 01:29 PM. Washington Post reporter, September, 1918. 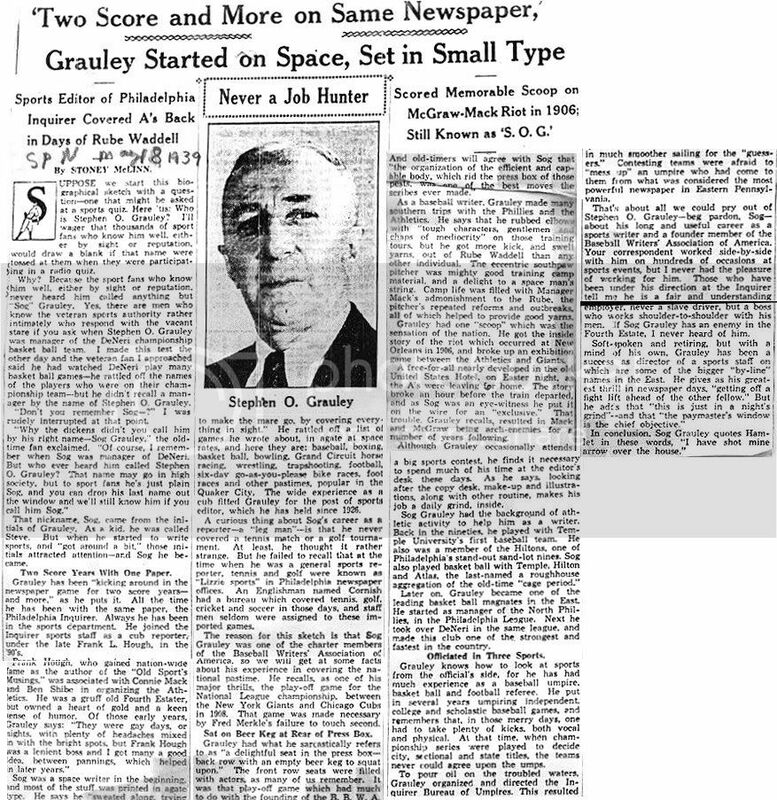 Washington Evening Star, 1920, retired in 1952 as sports copy editor. Who's Who in Major League Baseball, edited by Harold (Speed) Johnson, 1933, pp. 492. Last edited by Bill Burgess; 01-30-2013, 05:12 PM. Last edited by Bill Burgess; 01-18-2009, 03:33 PM. St. Louis Post-Dispatch baseball writer, 1929 - 1943), football expert. edited by Harold (Speed) Johnson, 1933, pp. 492.-------------February 19, 1943, pp. 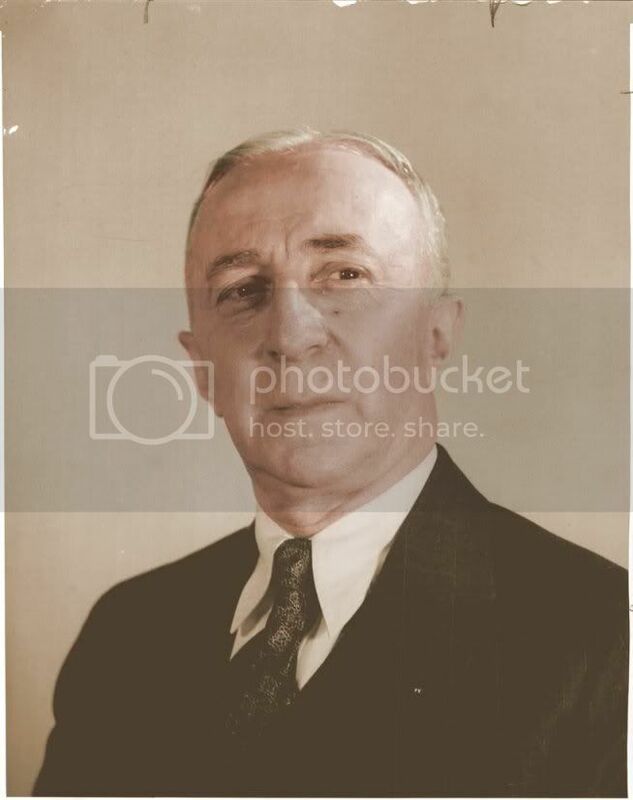 7, column 4.----February 17, 1943, pp. 21. Last edited by Bill Burgess; 12-08-2011, 01:39 PM. Graduated Phillips Academy (Andover, MA), 1889. Williams College (Williamstown, MA), 1892. Taught school in Columbus, OH, until 1898. Cincinnati Commercial-Tribune columnist, July, 1904. Cincinnati Enquirer sports editor, December 1, 1904 - 1936. One of his biggest regrets was he couldn't fight for the US in WWI. 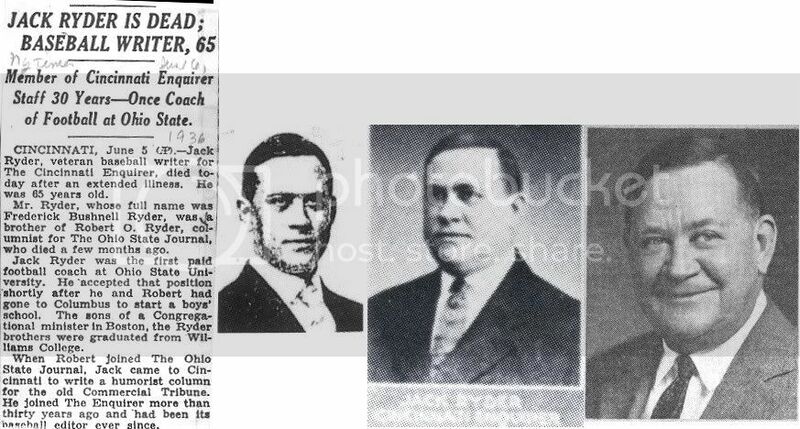 In 1905, Jack replaced Charles Webb Murphy on the Cincinnati Enquirer as sports writer and served there for more than 30 years. 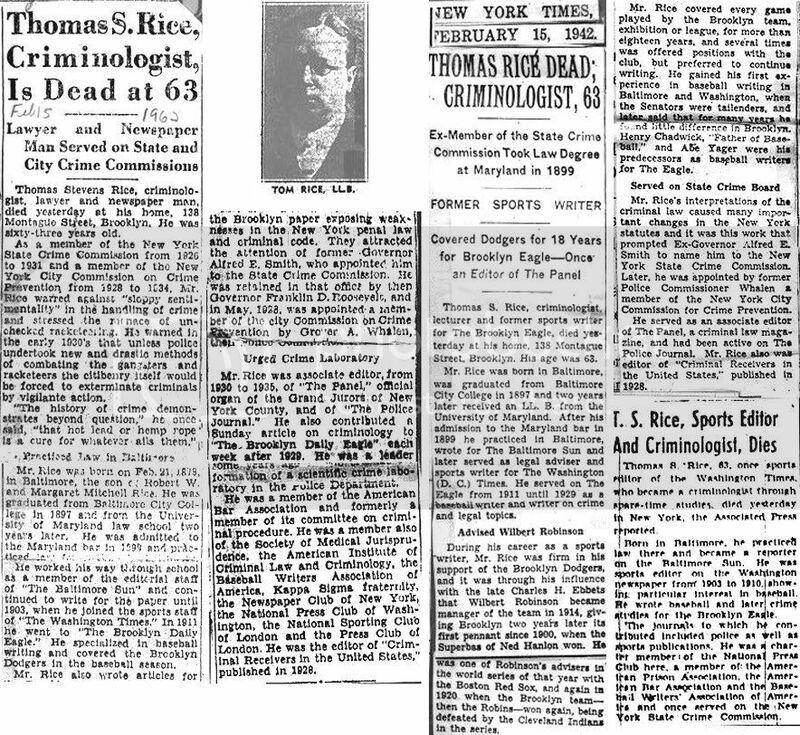 New York Times' obituary, June 6, 1936, pp. 17. ---------------------------------------------------------------------------------------edited by Harold (Speed) Johnson, 1933, pp. 493. Last edited by Bill Burgess; 08-05-2012, 11:36 AM. Enlisted for WWII, February, 1942, wounded by sniper in hand, June, 1944. 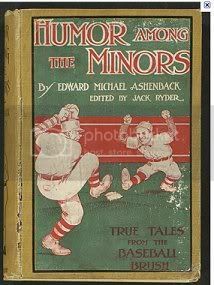 Richards Vidmer elevated the craft of sportswriting with the simple approach of amusing and entertaining his readers. His colorful prose enhanced the story but never overstated the message he was attempting to convey. Vidmer never took himself, or sports, too seriously. In the twenty years he reported sports he maintained a crisp, innovative approach, endowing almost every story he wrote with a fresh angle. Richards Vidmer was born on October 7, 1898 in Washington, D.C. He was the second child of George Vidmer and Carol Richards Vidmer. George Vidmer was a captain of cavalry in the United States Army at the time of Richards's birth. A poised career officer, George reached the rank of general and served as superintendent of West Point. Richards grew up on horseback and played polo. This familiarity with horses later enhanced his sportswriting when he reported on polo matches for The New York Times. Reared in the nomadic style of the military, Vidmer did not suffer from a parochial outlook on life. 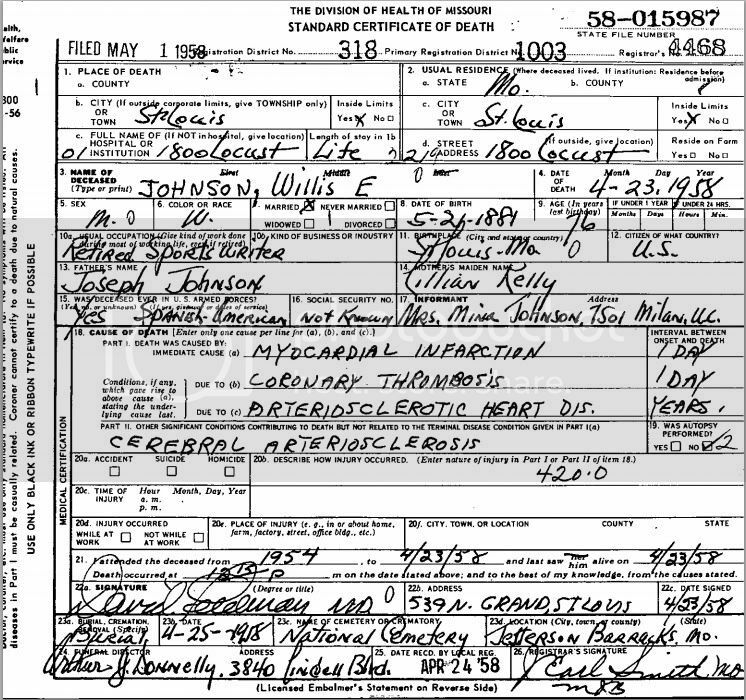 Before he reached his teens he had lived in Washington, D.C., Cuba, Japan, West Point, the Philippines, and Texas. As a result, he brought polish and worldliness to his later work as a sportswriter. Star athletes did not impress him as much as they did some of his peers. In 1917 Vidmer graduated from St. Luke's School in Wayne, Pennsylvania. Although he had been accepted at West Point as the United States entered World War I, Vidmer was eager to join the War effort. He passed on West Point and enlisted in the United States Army Air Corps, eventually earning his wings as a pursuit pilot. To his disappointment, however, he never experienced combat overseas. While attempting to land on a field in Hicksville, Long Island, following a routine training flight, his plane collided with another aircraft in an overcast sky. Of the four people aboard the two aircraft, Vidmer was the lone survivor. Nine months of surgery and rehabilitation in Walter Reed Hospital followed. After his release from the Air Corps, Vidmer enrolled at George Washington University. He had recovered from his wartime injuries sufficiently enough to play football and baseball in college. While still in high school he had played professional baseball in El Paso, Texas, but in order to protect his eventual college eligibility he had played under the name of "Widmeyer." Vidmer's experience as an athlete prepared him to report sports with insight. He knew that an errant bounce of the ball or a momentary lapse of concentration endowed even the greatest with feet of clay. He never hesitated to criticize a ballplayer for doing something foolish or irresponsible. 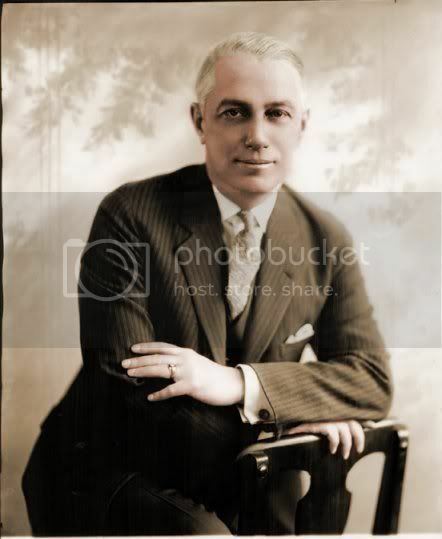 In June 1921 a casual meeting on a street in Washington initiated Vidmer's newspaper career. 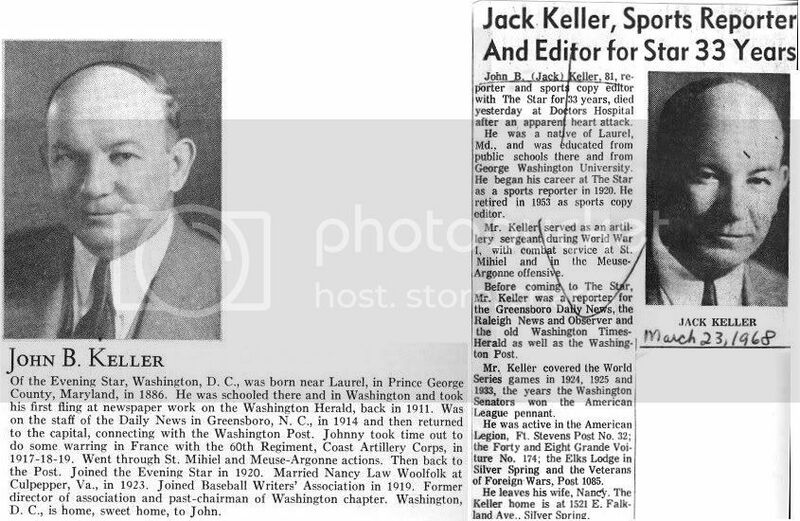 Just out of George Washington University, he met the managing editor of the Washington Herald, who offered Vidmer a job at $25 a week. He did general assignment work and on occasion wrote a feature story. His first feature was about the fiftieth anniversary of the Chicago fire. In June 1922 Vidmer married Miriam Miller in Washington, D.C. They had three children: two sons and a daughter. It was the first of three marriages for Vidmer. 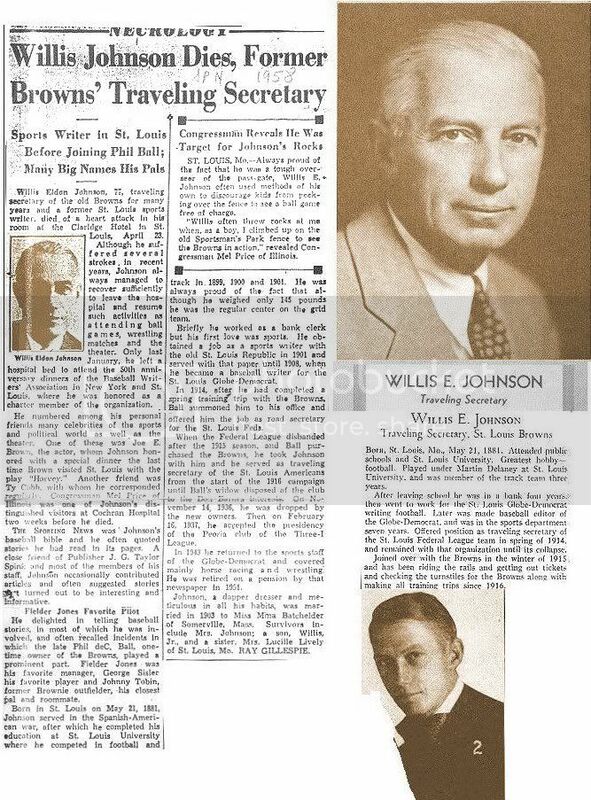 When Vidmer's managing editor at the Herald left to join the Washington Daily News in 1922, he took along Vidmer as sports editor. At the same time, Vidmer was the football coach at St. John's College, a military prep school in Washington. 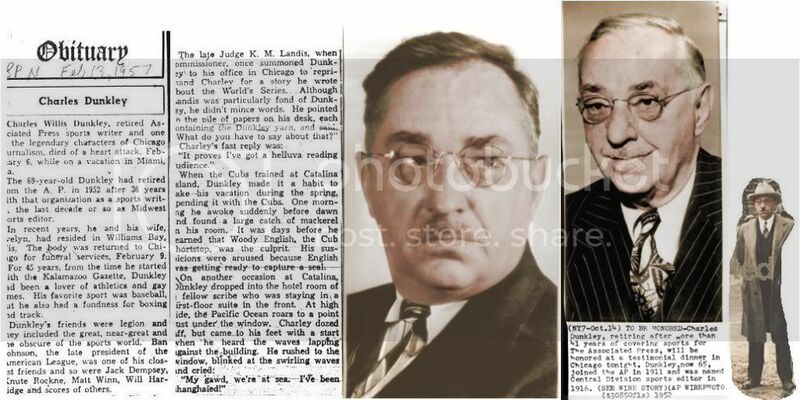 Knowledgeable of sports but unsure what an editor did, he accepted the position at the Daily News, covering the Washington Senators as well as football and boxing. 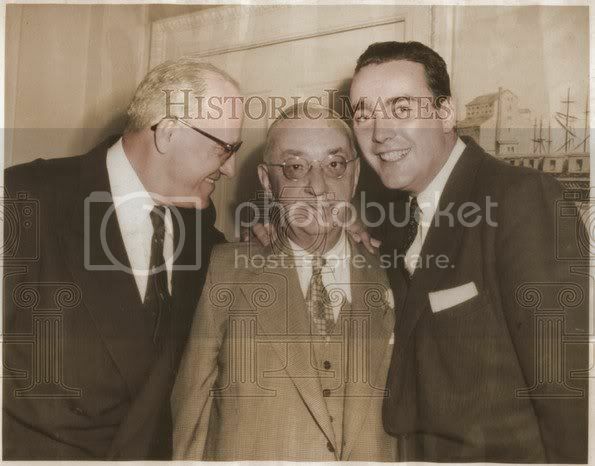 While in New York in 1924 to cover a heavyweight bout Vidmer visited the offices of The New York Times and spoke with managing editor Carr Van Anda, who introduced Vidmer to sports editor Bernard Thomson. Two weeks later Thomson offered Vidmer a job. Vidmer, unsure of his ability to compete in the New York market, hesitated to accept the offer. He recalled to Jerome Holtzman, the Chicago Tribune writer, that he asked his friend Washington Senators pitcher Walter Johnson for advice. Johnson encouraged him to take the job, saying that it had always been his dream to pitch in New York. 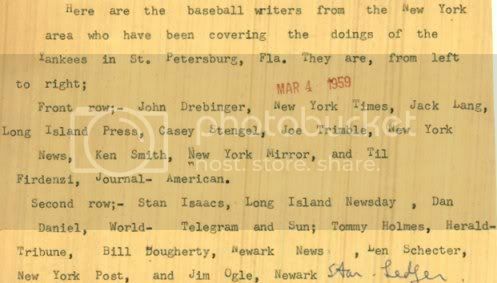 Vidmer reveled in the "gee whiz" style that dominated sportswriting in the 1920s, with its "jargon, florid phraseology and mixed figures," as Stanley Woodward characterized it in his Sports Page (1949). Vidmer preferred to begin his stories with an angle. 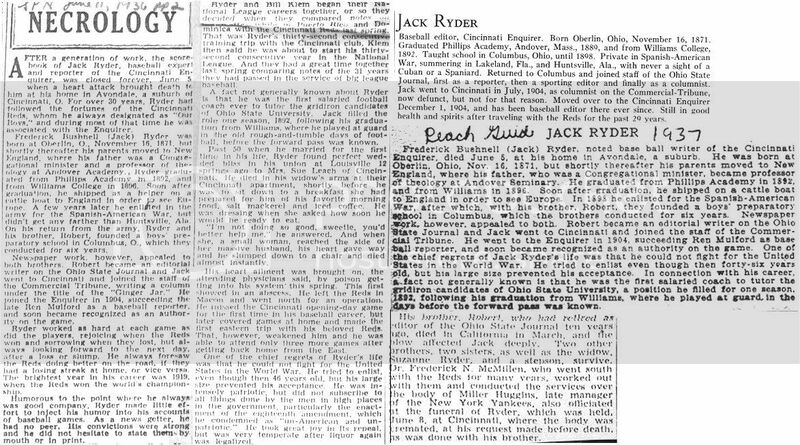 A story he wrote for The New York Times while covering the 1925 World Series between the Pittsburgh Pirates and Washington Senators, for example, leads by focusing on a former Pittsburgh player now relegated to obscurity: "Just after noon a big broad merchant emerged from his little shop on Wood Street. Who's Who in Major League Baseball, edited by Harold (Speed) Johnson, 1933, pp. 493.----------------------------------------------Sporting News' obituary, August 19, 1978, pp. 53, column 3. Last edited by Bill Burgess; 01-30-2013, 05:14 PM.